If you are in the market for a semi-rugged Push-To-Talk phone that offers a QWERTY keyboard, then the Motorola i886 meets those minimal requirements. It offers good battery life and strong signal performance, but voice quality is questionable. The hardware is not as well designed as I'd expect from Motorola, and the keyboard/dialpad both lack the type of feel I want in a phone. Beyond that, the i886 handles basic messaging (text, video, and email) as well as any feature phone, though it suffers from the lack of social networking and IM. The user interface smacks of Android, which I think translates well to a non-touch based phone. The OS gives users plenty of flexibility and is easy to figure out. It's a shame that image and video quality were so poor. The i886 beat my browsing expectations handily thanks to Opera Mini. 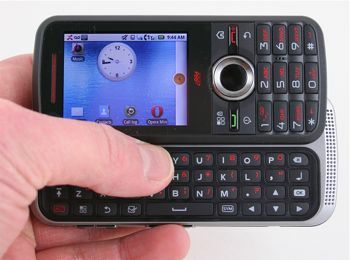 Though it runs an Android-like OS, it is important to remember that the i886 isn't an Android phone. It is not compatible with any Google services as found on Android devices. Still, for the right crowd, the i886 definitely fills a gap in Sprint's line-up. Samsung today announced the Galaxy S7 Active, a semi-rugged version of its S7 flagship smartphone. The Active has a sturdier metal frame with rubber-coated corners to help protect it. Motorola today announced the Moto Z3 Play, its third-generation Mod-compatible mid-range phone. The Z3 Play carries over the general size and shape of previous Z-branded phones in order to maintain backward compatibility with the Moto Mod snap-on accessories. Qualcomm today revealed that the Kryo 385 CPU in the Snapdragon 845 mobile platform does not use off-the-shelf cores and instead relies on semi-custom cores. Processor designers often use cores such as those created by ARM.